I tried to send the following email, with an encrypted email service, but without using the “confidential” mode with individual passwords, and I did not succeed in sending 100 at a time. It seems that, at least right now, the world controllers, the New World Order, are blocking group emails but my WEB sites are still basically open. Thus, for over two years now, I publish my more important articles on three different WEB sites. How are you? I hope that you are more and more close to Jesus with the cross and Mary at the foot of the cross with the Rosary in hand! Spend as much time as possible on your knees before our Eucharistic Lord!!! I hope this email gets through to you. I have discovered that many of my emails to you end up in your SPAM! Check your SPAM! But if you want to respond or communicate with me, you can continue to use my Gmail, josephdwight57@gmail.com. So far Gmail does not block my emails if I send less than 20 emails at a time. I would suggest that you copy any articles that you might want to save before they might be removed from the WEB by the NWO. I am discovering that more and more WEB sites that reveal what the Masons are doing behind the scenes are being removed from the WEB. One such site, which had many articles about what is going on at Santa Marta, where Bergoglio hangs out, and disappeared around March 7, 2018, is: https://anonimidellacroceblog.wordpress.com. Perhaps this Oath will not take place on March 28, 2018, but sooner or later it will happen! “Dear Sons and Daughters, your life here on earth is, in truth, a continual succession of encounters with My Son Jesus, but the encounter most important with Jesus you have in the Eucharist. Value the Presence of My Jesus. There will come the day in which the Precious Food in many places will be taken away. Times will come when YOUR ENCOUNTER WITH MY JESUS WILL BE GIVEN IN SECRET, thanks to the Faithful Ministers who will remain firm in the truth. The time announced by God through Daniel will come. Be attentive. …” (Message 4442, given on 03/16/2017) (“Soon No More Eucharist Anguera”; http://spir-food.blogspot.it/2017/03/soon-no-more-eucharist-anguera.html; https://josephdwight.wordpress.com/2017/03/18/soon-no-more-eucharist-anguera/). Visit: “The Eucharist in the Catacombs “ (http://spir-food.blogspot.it/2017/10/the-eucharist-in-catacombs.html). Our Lady told me that the times are very difficult. As I said in Amazonia, I say also to you: that which still holds back to a certain extent the evil, as long as he is alive, is Pope Benedict. When Pope Benedict dies … poor humanity! I can say this with all sincerity. When Pope Benedict goes away … poor Church and poor humanity! And we must pray much. What is his name? Joseph. The month of Saint Joseph arrives … one never knows if Saint Joseph might come to take him in his month, or on his feast day …” (the feast day of Saint Joseph is March 19!) (https://oracolocooperatoresveritatis.wordpress.com/2018/02/18/itapiranga-con-la-morte-di-benedetto-xvi-il-diavolo-si-scatenera/; https://youtu.be/X7ntOpC4wSY). “I went to vote today, March 4, 2018, in Italy, and I said before those present where one votes, even though you must not say who to vote for, I said we must vote for GOD, because only GOD can save Italy!!! To vote for God means to make a good monthly confession according to the 10 Commandments explained in the Catechism of the Catholic Church for adults (CCC; ed. 1992, not 2017!!! ), not according to the TV, the Holy Sunday Mass, and the Holy Rosary everyday!!! Saint Padre Pio said: "It would be easier for the world to survive without the sun than to do so without the HOLY MASS." This saint also said: “The ROSARY is the weapon for these times”! Although there are few bishops, priests and lay people who have kept their eyes open to the signs of the times and to the strategy of our immortal enemy, and are ready and willing to follow Christ crucified right now, “The blood of martyrs is the seed of Christians” – Tertullian. 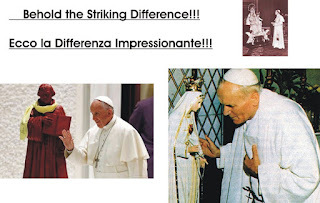 Thus in the end, as Our Lady revealed to Don Stefano Gobbi for these our times (November 22, 1992; “To The Priests Our Lady’s Beloved Sons”; http://our-lady-priests.blogspot.it/), we will see fulfilled the prophecies of Zechariah: “An oracle of the Lord: I will strike the shepherd, and the sheep will be completely scattered; and then I will turn my hand against the little ones. An oracle of the Lord: In all the land, two thirds of them will be cut off and perish; and one third shall be left. I will pass this third through fire; I will refine it as silver is refined, test it as gold is tested. `It will call upon my Name, and I will hear it; I will say:"This is my people.” And it will say: “The Lord is my God.(cf. Zec 13:7-9)” (“Do Not Abandon the Church”; http://spir-food.blogspot.it/2017/12/do-not-abandon-church.html). Let us hope and pray that we will be part of “this third” that will pass through fire here on earth, and not the “two thirds” that will pass eternity in the fires of hell! “Only a Remnant Will Remain Faithful to the Truth” (http://spir-food.blogspot.it/2017/09/only-remnant-will-remain-faithful-to.html)! On April 16, 2018, the administrators of the group ‘One Million Connected Catholics’ did not publish my post: “How many Catholics today could answer simple questions such as the following? … “Who Decides The Truth?” (http://spir-food.blogspot.it/2014/06/who-decides-truth.html). If you think you're seeing this by mistake, please let us know. To help keep Facebook safe, we sometimes block certain content and actions. If you think we’ve made a mistake, please let us know. While we aren’t able to review individual reports, the feedback you provide will help us improve the ways we keep Facebook safe. My response: What are the reasons for this Facebook Block, and who is responsible for this action? Thanks for taking the time to submit a report. Learn more about what happens when you’re blocked or if your content was removed. You have been restricted from accessing some Facebook features.